FERINTOSH, Alta. — Takota Coen beckons his hogs to come out onto the green pasture. The animals follow him through a small opening in the fence and begin to forage. He approaches the pigs for a belly rub. Some are typically wary, but he manages to find one that lies down. He begins to rub the sow’s tummy. “I look to breed ones like this,” Coen says, as the animal relaxes. After a few rubs, Coen heads back through the opening in the fence and into the pen. He again calls the pigs and begins to dump feed into the feeders. It’s a mixture of milk-sprouted grain. The animals race back from the pasture, excitedly devouring every morsel. In the backdrop, there’s a sign that reads “hog heaven”. “That sign just about says it all,” he says. This scene takes place daily at this time of year on the Coen family farm near Ferintosh. Takota runs it with his parents, Michael and Laura. 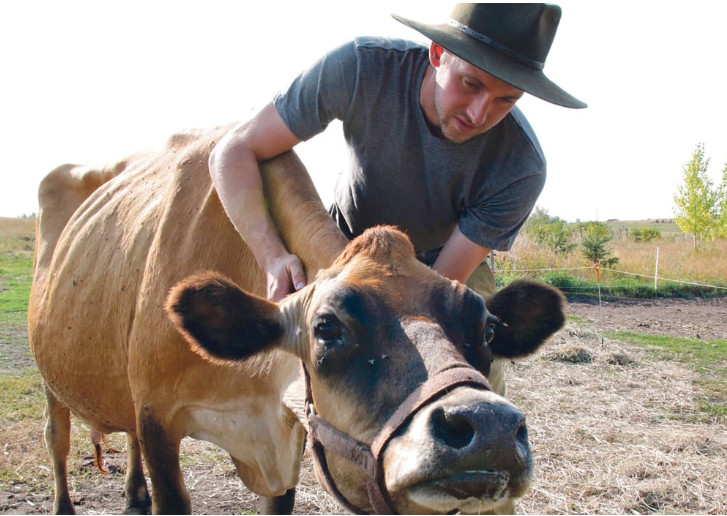 The 250-acre organic farm stays true to permaculture and regenerative agriculture. Organic farming practices are used to improve the environment, with the aim of improving yields and decreasing inputs. The family directly markets all of their products, which include pork, beef, eggs and a variety of berries. They make yearly trips to larger cities, delivering their product to consumers. But the Coen Farm hasn’t always operated this way. Michael bought the land in 1984 and farmed conventionally, selling grain through commodity marketing systems. In 1988, however, the family switched to organic after an issue involving herbicides. Takota said during one afternoon then, Laura began to feel light-headed after coming from the field to get lunch. Michael had been spraying at the time. From there, the family conducted further research on herbicide use and figured it was best for them to go organic. As well, there were lots of organic farming neighbours in the area they could turn to for advice. “When my mom had that immediate reaction while being around the spray, they decided to quit cold turkey and transitioned everything,” Takota said. But it wouldn’t be the last time the family made some changes. After selling grain, operating cow-calf pairs and direct-marketing hay, Takota worked with his parents to develop the permaculture system they have now. He said his parents had been burned by the markets a few times, and he thought selling directly to consumers could give the family more control. When they were selling hay directly, for instance, he said they had the most success. “With the hay, they had more control over the price,” he said. Takota has only recently been part of the farm business. While growing up, he said he always got the impression he should do something other than farming. “They never told me to not stay on the farm, but they implied I go do something else to have a good quality of life and less stress than they had,” he said. Listening to his parents, he worked as journeyman in in carpentry but he couldn’t contain his passion for farming. In 2012, he told his parents he wanted to make a go of it full-time. He also took a course to better understand permaculture. “I realized all I really ever wanted to do was be a farmer,” he said. In fact, this is the first year he has bought shares in the business. While switching to a permaculture system has been successful financially and environmentally, Takota said the family did go through some challenges during the beginning of the transition. For instance, he said when they were redesigning the water system, some contractors wanted more money than it was worth. The system included creating a dugout, installing solar-powered pumps and carving out swales to improve the capturing water runoff. But through all of the ups and downs, he said he has been grateful to have his parents. Their openness and wisdom are essential.